Learn how to make a square origami snack box. This box is tapered at the top, making anything inside stay put. Easy to follow step by step instructions. This is a variation of a very popular traditional origami model. You can find the original box (and instructions) here. This time, the box is much neater and you cannot pull apart the box after it's finished. You can store or send these boxes flat - for a gift, it's fun for the recipient to pull the box apart themselves. 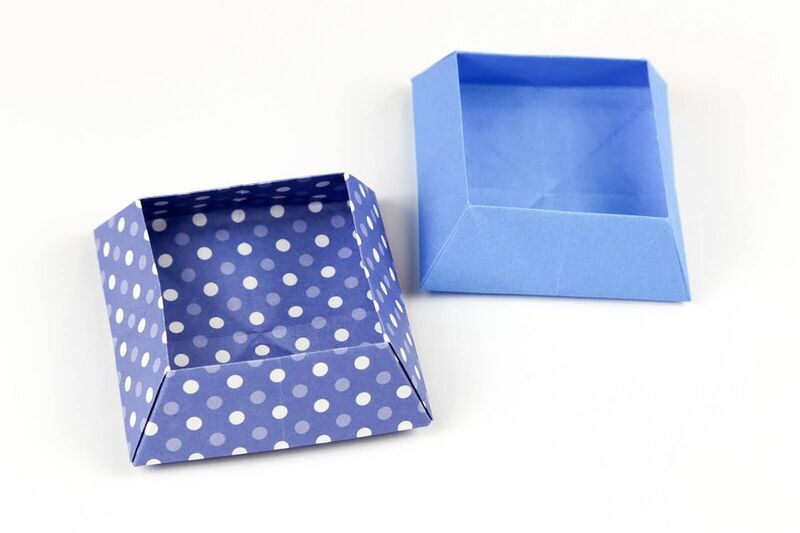 These boxes are also perfect to use at a party or gathering, make them with festive paper for different occasions. You will need one sheet of square paper for this tutorial. 1.Start with the paper with the final colour or pattern facing up. Fold it in half, left to right and top to bottom and unfold. 2. Flip the paper over to the other side. Fold the paper in half diagonally both ways and unfold. 3. Flip the paper back over. Pull the left and right corners down, collapsing the top down and flatten it out. 4. Rotate the model so that the open end is at the top. 5. Fold the top of the front layer down to the bottom. 6. Repeat on the back. 7. Fold the left and right corners together and the same on the back. 8. Now you have this. 9. Fold the top of the front layer down to the bottom and repeat on the back. 10. Open them back up. 11. Fold the right side in to the middle. As if you are going to fold the whole thing, but only fold the lower section. 12. Make sure the bottom of that flap is nicely horizontal. 13. Let the right side go and repeat on the left. 14. Now fold them both to the middle. 15. Open out the edges against the diagonal flap. 16. Flatten the top down. 17. Fold the bottom corner up. 18. Fold the top corner down. 19. Refold the flap down and insert it underneath the flaps. 22. This is the result. 21. Repeat all of that on the back. 22. Put your hands inside the box, and gently pull the box open. 23. Straighten out the edges of the box.